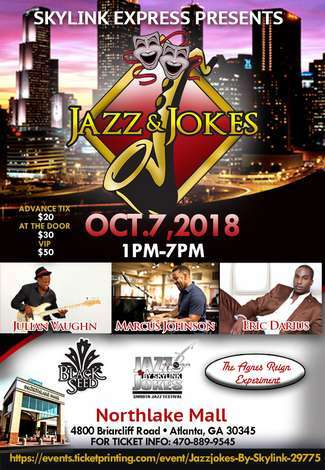 Fall Smooth Jazz Festival presented by Skylink Express, #1 casino bus service from Atlanta, GA. Live entertainment includes Jazz artists, Marcus Johnson & Jullian Vaughn and live band "Black Seed" and "The Agnes Reign Experiment" There will be various food truck vendors and beverages. Enjoy fantastic shopping, live music, great food, raffles and more! Payment method for all general admission is "cash only"